As we age, it can become increasingly difficult to combat the signs of ageing on the face. There is no doubt that surgical procedures provide the most reliable, effective and permanent results. But many individuals may not want to consider surgery and under these circumstances the increasing reliability of cosmetic injectables means that they are now a reasonable option to consider if you are not ready for surgery. Anti-wrinkle injections (the most commonly known brand being Botox) work to essentially freeze the muscles in the face. Every single day, our facial muscles are massively overworked by unavoidable tasks like smiling, chewing and speaking. This isn’t that much of a problem when we’re young, because the skin is plump and bouncy, meaning it can easily withstand the strain we put upon it. But as we age and with the effect of sunlight our natural collagen production slows down and our skin loses its natural elastin and resistance, meaning it becomes thinner and loses it firmness. Anti-wrinkle injections limit muscle movement in the treatment area which results in smoothing out wrinkles. Mr. Chana will only administer a set amount of anti-wrinkle treatment in order to avoid the ‘frozen’ look that is often associated with poorly executed Botox injections. Botox is best used in the upper half of the face such as the forehead, frown lines and around the eyes but its use is limited around the mouth since high doses of Botox here can result in distorted facial expression and mouth movement. For the areas around the mouth and nose fillers are more appropriate. 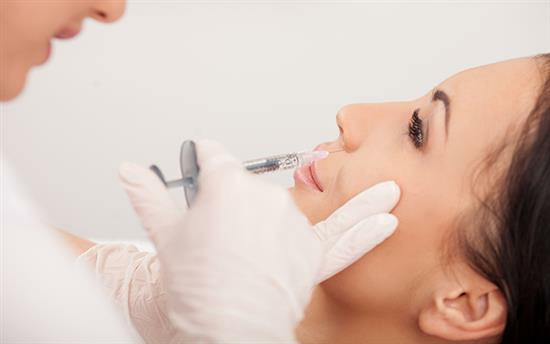 Dermal fillers are made up predominantly of hyaluronic acid, a substance that is naturally found in the skin tissue but can be replicated cosmetically. When injected into the face, they have a ‘plumping’ quality, filling out lines and wrinkles and restoring some of the youthful volume into the face that we naturally lose over time. Fillers are particularly useful for the deeper lines such as those which occur around the mouth and nose and are also used to increase the volume of the lips. Anti-ageing injections and dermal fillers both work well as standalone treatments, and many people enjoy visible results from having just one of the treatments. However, when combined, the results are further enhanced, and have a dual function. Whilst dermal fillers can plump out the face, reducing the look of gaunt, sagging skin and filling in deep lines and wrinkles, anti-ageing injections freeze the facial muscles and prevent the face from further overwork that causes the sagging and wrinkles to form. In this way, you can view a combined treatment as both a solution to your existing skin woes, and a preventative measure against them getting worse. Patients report the combined effect Botox and fillers offers beneficial results for facial rejuvenation, allowing them to look younger without looking unnatural. Unlike surgery, most people are suitable candidates for non-surgical facial rejuvenation like Botox and fillers. An allergic reaction is a possible risk, but the chances of this are extremely low. It is important to realise that the effects of Botox during a pregnancy are not known and hence this situation should be avoided. If you have any other health concerns or pre-existing conditions that you think might make you unsuitable for facial injectables, mention these to Mr. Chana during your consultation. Overall, dermal fillers and anti-ageing injections can be used to address most signs of ageing, from the preliminary signs of ageing to more moderate lines and wrinkles. Your skin condition, along with the results you are hoping to garner from the surgery, may affect the number of injections you have, and where you have them in your face. Obviously, all treatments are administered in moderation and after careful consideration from Mr. Chana, who places a strong emphasis on achieving natural looking results. If you are interested in anti-ageing injections, dermal fillers, or both combining Botox and fillers for a dual procedure, you should contact Mr. Chana’s clinic in order to arrange a consultation. Take along pictures of your desired results if you wish – pictures of you when you were slightly younger are particularly helpful, especially if there’s a particular area of treatment that you feel has declined over the years. Cosmetic treatments aren’t for everyone, and they’re not a decision to be taken lightly. Use your consultation to really learn the details about your procedure and to make a balanced choice about whether it is appropriate for you.